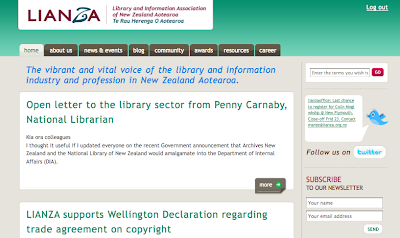 LIANZA, The Library and Information Association of New Zealand, Aotearoa, has a new web site. Critiquing collegiate web sites can cause lots of problems - people get hurt - sensitivities are provoked. Nevertheless, it is to be hoped the NZ library community can both benefit from, and be able to participate in, some robust internal and external debate on what will be their primary online home for a couple of years at least. There seems to be a big emphasis on the profession - its members and concerns et al. I would like to see this extended to include key supporters and users of libraries - especially public libraries. I would also love to see a lot more on how libraries serve this wider stakeholder constituency - via case studies - key facts on economic value - in short - as the Brits once had it - build the evidence base for the economic and cultural value of libraries. Here in NZ, the LIANZA library conference in October is one of the great meeting points for cultural/heritage/arts people, especially online. There are literally dozens of great LIANZA conference sessions on record over the last 5/10 years - including the seminal presentations from the likes of Larry Lessig in Auckland 2008. Why cant we have a selection of these videos up on line? I know the automatic response is rights - but that must be under control now? After all the sessions are for sale within an hour of the presentation at the conference , and I don't know of any speaker who gets a royalty from these. So please can we have a video wall up and running now - whether via a You Tube or Vimeo Channel - this stuff is just so achievable. The NZ Libs list serve has the occasional Friday moment - I have offered more than a few myself - why not this feature here? There must be a mile of interesting ways to create the community effect the site is aspiring to. Can we have a composite one - i.e. what are people reading? Would make a great tag cloud? Would also make a great Twitter feed? 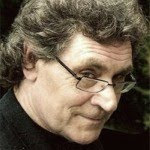 In summary I would love to see a really robust debate from within the profession - and, dare I say, the outside world - on the content and editorial plans for the site, and leave the debate on colours, and micro-managing the information architecture for another day. totally agree with you Paul. The site is actually riddled with technical problems. I believe Megan wanted to see this baby off into the world before she had her own real one, with the latter the one requiring the real work and attention. Posts on the new LIANZA website are spawning already with debate happening. It was upsetting to see the web design team's work to date being critiqued so openly on a forum such as nz-libs. I think it was a little inappropriate and inconsiderate. I believe we need to get some content up from other avenues such as interviews of past conference speakers on youtube or vimeo. I think that would be great. Also 4, 5 and 6 able to be implemented easily. Visual design & IA are important, but as you say - content is the actual point of most sites. I'm sure there's loads of it tucked away, ready to be released upon the world once the task of transferring content from the old site to the new is completed. I'm also sure that bugs will being being fixed as swiftly as possible, and that a wish-list of enhancements will be building up already. As we both know, community is harder than it looks. Personally, I think the two best thing members of the library profession can do if they want to improve the experience of the site is report bugs (and remember how helpful screenshots and links are in these reports!) and create a profile & start contributing to the community section. Hi Paul I agree that debate and conversation and feedback are so necessary for any new site. Content, is, indeed, totally, vital, but really bad display in common browsers and ipsum dorum stuff is a seriously bad mistake. Unfortunately with the LIANZA site it seems that there isn' t a clear forum for feedback on either of these matters. I have been a wee bit disappointed. The bugs have only reinforced my bad impression of Drupal. I agree with your points, Paul. I think the potential is there for it to be a much better, richer, more engaging site than it currently is. Librarians are, generally speaking, fussy 'attention to detail' people, myself included, so it's no great surprise that the annoying fiddly things are what many of us are irked by at the moment. I would love to see content that is contributed from all over the place, an acknowledgment of the fact that LIANZA is part of a broader community of NZ librarianship and information management (how about Christchurch City Libraries or The Room of Infinite Diligence blogs on your blogroll? Or this one? ), and quite frankly the overwhelming "texti-ness" of the pages frustrates me. I want to see pictures of librarians and librarians being interesting! So, I'm a little disappointed in it at the moment, possibly just because it looks like most of the content has just been replicated from the old site. Hopefully this will grow and change as things carry on. I will certainly be checking in often to see how things progress. @Hana the fact that one of the project team is having a baby is completely irrelevant to this discussion. I would feel very upset if someone made such a comment about me verbally - let alone online.